L. Frank Baum wrote thirteen books about the Land of Oz, beginning with The Wonderful Wizard of Oz which was published in 1900. This passage is from The Road to Oz published in 1909. In this book, Dorothy meets new friends on her way to visit Oz again. The shaggy man is a wandering man that she and her dog, Toto, met in Kansas. Button-Bright is a little boy who often gets lost. Polychrome, or Polly for short, is the Rainbow’s Daughter and has fallen off her father’s rainbow. 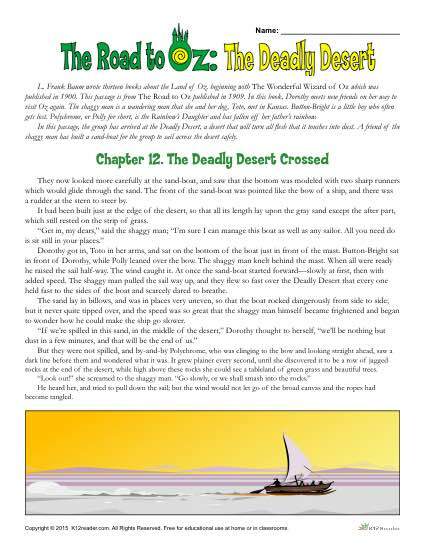 Students read a passage from the story and then complete the exercises. There are several worksheets included in this set, on reading comprehension, vocabulary and more.